NASA’s next planet-hunting mission has arrived in Florida to begin preparations for launch — the Transiting Exoplanet Survey Satellite (TESS) is scheduled to launch on a SpaceX Falcon 9 rocket from Cape Canaveral Air Force Station nearby NASA’s Kennedy Space Center in Florida no earlier than April 16, pending range approval. The Transiting Exoplanet Survey Satellite arrives at NASA’s Kennedy Space Center, where it will undergo final preparations for launch. Launch is scheduled for no earlier than April 16, pending range approval. 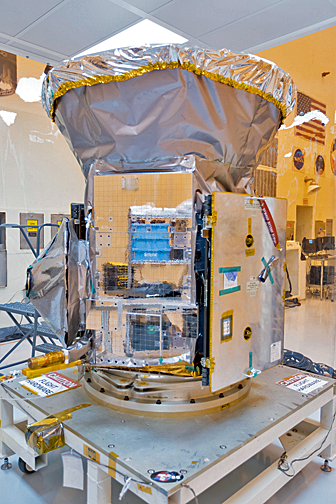 TESS was delivered February 12 aboard a truck from Orbital ATK in Dulles, Virginia, where it spent 2017 being assembled and tested. Over the next month, the spacecraft will be prepped for launch at Kennedy’s Payload Hazardous Servicing Facility (PHSF). TESS is the next step in NASA’s search for planets outside our solar system, known as exoplanets. The mission will scan nearly the entire sky to monitor more than 200,000 of the nearest and brightest stars in search of transit events — periodic dips in a star’s brightness caused by planets passing in front of their stars. TESS is expected to find thousands of exoplanets. The upcoming James Webb Space Telescope, scheduled for launch in 2019, will provide important follow-up observations of some of the most promising TESS-discovered exoplanets, allowing scientists to study their atmospheres and, in some special cases, to search for signs that these planets could support life. TESS is a NASA Astrophysics Explorer mission led and operated by MIT in Cambridge, Massachusetts, and managed by NASA’s Goddard Space Flight Center in Greenbelt, Maryland. Dr. George Ricker of MIT’s Kavli Institute for Astrophysics and Space Research serves as principal investigator for the mission. Additional partners include Orbital ATK, NASA’s Ames Research Center in California’s Silicon Valley, the Harvard-Smithsonian Center for Astrophysics and the Space Telescope Science Institute. More than a dozen universities, research institutes and observatories worldwide are participants in the mission. NASA’s Launch Services Program is responsible for launch management. SpaceX of Hawthorne, California, is the provider of the Falcon 9 launch service.